This photo shows the intact pond, before the breach. The red mud suspension floats on top of the settled solid mud in the highly alkaline water. The red mud gets slowly settled in the pond. The dike of the storage facility is made of flyash. 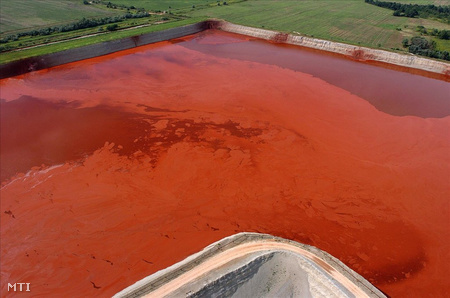 This is a common practice in the construction of red mud storage impoundments: it is cheaper than the concrete and due to the puzzolan activity of the flyash ( solidification in contact with water) the dike is usually solid and resistant to pressure ( in general).